November 10, 2009 (San Diego’s East County)--Insurance Commissioner Steve Poizner yesterday announced that the Department of Insurance (CDI) has recovered more than $27 million from insurance companies for consumers. The recoveries were made through the department’s complaint process in the aftermath of the devastating Witch Creek fire in San Diego County that killed two people, destroyed 1,650 structures and burned more than 197,000 acres in Oct. 2007. "I am pleased that the Department's aggressive action on behalf of consumers has resulted in more than $27 million back in the pockets of wildfire survivors," said Commissioner Poizner. CDI was able to recover these funds for consumers that notified the Department of their problems and suspected unfair treatment by their insurer. CDI received 391 consumer complaints since late 2007. Of the 391 complaints received from consumers, 70 involved underinsurance allegations. CDI recovered more than $4 million for consumers who had complaints stemming from underinsurance issues. 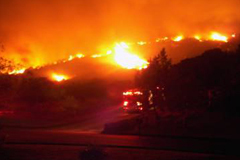 As a result of the 2007 wildfires, nearly 40,000 claims were filed. The 2007 fires caused $2.3 billion in losses.California has suffered through the most damaging consecutive wildfire seasons on record. Since 1932, when the California Department of Forestry and Fire Protection started keeping records, six of the top 20 worst fires in state history in acres burned and structures destroyed occurred in 2007 and 2008, including last November's Sayre fire in Los Angeles County that burned 11,262 acres and reduced 604 buildings to ashes. Those six fires combined killed 22 people, burned 3,734 structures and torched nearly 1 million acres. CDI has recovered more than $50 million for insured residents from the 2007 and 2008 wildfires. "I also want to remind wildfire survivors struggling with their insurance company who haven't contacted the Department that we are here to help," continued Commissioner Poizner. "I urge anyone having difficulty with their insurance company to contact the CDI Consumer Hotline at 800-927-HELP."